Good thing about record stores is that you end up buying artists that you consider “unknown” until the act of purchase. San Proper did not ring any bells until listening moments at Rush Hour Amsterdam, now it seems to be among best releases of this month. Home spinning confirmed the choice to be excellent with Amsterdamer’s scarce beats and stripped-down house arrangements. On the A-side San Proper has sneaked into financial district elevators with his field recording equipment to examine the charms of lower spheres of high-rises. Hypnotic humming-along and bony percussion mixed with noises from the world of motors and sultry voices make “Groundfloor (UpfromdaWall&on…)” a good choice for any demanding dance floor. 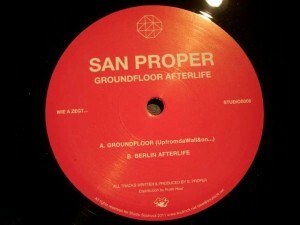 “Berlin Afterlife” combines aircraft noise, xylophonic bells and public transport-related voice samples for a tranced-out deep house cut. Two extra long tracks between Giegling, Kassem Mosse and Hauntologists. Einsteigen, bitte!